When we bought our house in Sandpoint, Idaho in 2002, there were no moose, and there were a lot of tulips. People who lived outside of town had to build fences to protect their gardens, but not us. We had bugs and slugs. That was it. Moose lived out in the woods where moose belonged, and we rarely spotted them. That changed one snowy morning when I was talking on the phone. A moose passed through my line of vision as I gazed out the window into our backyard. It moved in three feet of snow as if the snow wasn’t there. I dropped the phone. That would have been about 2008. It was the first of many visits by that moose and others. Moose are massive and a bit ungainly, and it was exciting to watch them move around the neighborhood. They munched on our weeping willow, which had long drooping branches that had always been a bother, so we appreciated that. But when they went after the blueberry bushes and apple trees, we segued quickly from amazement to annoyance. We threw stuff at them — anything that was standing by the back door — snow shovels, ski poles, the random trowel left over from fall gardening. Since none of these items was designed for accurate throwing, we never hit them, and they gave no indication that they noticed they were under assault. We blew a whistle, rang a bell, blew an air horn. They looked at us with mild amusement. Moose settled in. We saw them around town, munching on anything about head height (for them, six feet and up). Sometimes we would awaken to discover, as the light came up, that dark mass in the alley was a sleeping moose. Sometimes we would realize we were walking within a few feet of one browsing on branches near the sidewalk. When spring came, and tulip leaves poked up from the thawing ground, we eagerly awaited the annual spread of pink and white blooms in the front yard. It never came. Instead, we could see truncated half-leaves where moose had neatly clipped off the tops along with the buds. As we contemplated next steps, the moose disappeared. Apparently they had somewhere better to go in summer. But in the fall, they were back, and they showed a fondness for cabbage as well as apples and blueberry shoots. We got a slingshot and launched marbles at them, but our accuracy was only slightly better than it had been with snow shovels and ski poles. On the rare occasion that a marble was on target, the moose just gave us an annoyed look, as though it had been bitten by a mosquito. The biggest effect we managed to have was on our neighbor’s car, when an errant marble missed a moose and went on to create an expensive little ding in the door. 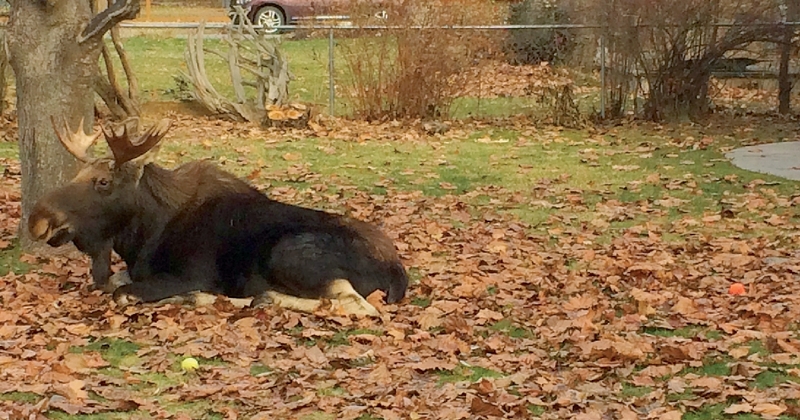 Now we realize there’s little point in fighting it: The moose have adapted to city life. Moose mothers bring their calves — one even had adorable twins — through the neighborhood, showing them where there will be buds to eat in spring and cabbages in the fall. Moose sleep in the alleys and wander the yards, wowing visitors as much as they annoy locals. So we have adapted, too. Our local grade school has a moose protocol, keeping children indoors when moose are on the playground. Neighbors call when moose are on the way, and we stand by with our slingshot in a quixotic attempt to protect what we can. Cate Huisman is a freelance writer and editor—and frustrated gardener—who lives in Sandpoint, Idaho.